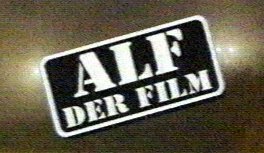 "Project: ALF", the ALF tv movie, is called "ALF - der Film" (= ALF - the movie) in Germany. Everyone who saw the very last episode of the series "ALF" (ep. #102 - "Consider Me Gone") noticed that it is not a real ending. In the very first airing in the USA, even a "...To Be Continued" could be read which disappeared lated. So it's more kind of an open end, which allows the producers to continue the story later. Well, it took six years (from 1990 to 1996) until the creators of ALF, Paul Fusco and Tom Patchett, decided to use this chance. They produced "Project: ALF", a 1-and-a-half-hour-long tv movie which aired also 1996 on ABC. (Not NBC where the series was aired). While in the USA, "Project ALF" was only shown on TV, in Germany, due to ALF's popularity here still in 1996, the tv movie came into the theaters! It was not that successful in the cinema, though, but around 250.000 people watched ALF in the german movie theaters (although ALF the TV series was showed daily on TV at the same time). A few month later, the american TV movie "Project: ALF", which is called "ALF - der Film" in Germany, came into the video stores. 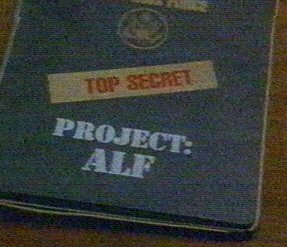 And on 21th July 1998, finally "Project: ALF" was shown on Germany TV. Of course, it was aired in prime time (8.15 p.m.) on RTL TV and it ratings were really amazing. Due to a soccer championchips game which was on at the same time, only 3.2 million people watched the film (without the game it would have been more, I think), but it more than every other big motion picture had that evening. There's more about "ALF - der Film" on my german Project ALF page which I haven't translated yet, but it is related to the German airing of the film (like the last paragraph before this).